To look at it, you'd think that area of space would be positively crammed with loads of tumbling boulders, all bumping into one another. Truth is, it's nothing like that at all. Most of this belt is empty. Although some 150,000 asteroids have been catalogued, current estimates of their total number is at the 1.2 million mark. Due to the size of the volume of space they occupy, that would make the average distance between them about as far as the Earth to the Sun. Let's up the ante and suggest that there could be as many as ten million asteroids. They would still be spaced apart at a distance similar to that separating the Earth and the Moon. In fact, it has been estimated that, if you took all the asteroids and clumped them together in one lump, the result would be something like one twenty-fifth the size of the Moon. So, for such a small amount of stuff to be distributed within such a huge volume, the individual asteroids would have to be extremely spaced out. Where Did The Asteroid Belt Come From? If it's anything you've ever considered - how the asteroid belt came to be there - I bet you think it's the remains of a planet that was shattered by some collision or other in the distant past. It's the obvious theory, isn't it? In fact, this was the originally accepted view in the early days of asteroid observation, during the first half of the 19th century. As time went on and more became known about the belt, this theory was discredited. The force required to shatter a planet would be formidable and individual asteroids have been shown to have different chemical composition, which would not be the case if they formed from the same planet. The accepted view today is that they are a "failed" planet. All the inner solar system consists of planets that were originally a ring of small rocks orbiting the Sun. Gradually, gravity pulled them together to form Mercury, Venus, Earth and Mars. The rocks making up the asteroid belt were not so lucky. By this time, the outer gas giant planets had already formed, including the formidable Jupiter. The largest planet in the solar system is so huge that its gravity can affect nearby objects very strongly. Any attempt by the asteroids to clump together to form a fifth inner planet was foiled by Jupiter's gravity. Thus, they remain to this day - "the planet that never was". The belt, as it was at the time of the formation of the solar system, is known as the primordial belt. It is thought, back then, it consisted of enough debris to form an Earth-sized planet. During the following million years, however, much of it was ejected, mainly by gravitational perturbations. Left behind was about 1% of the original mass and the belt then became stable and remains so to this day. Any astrogeologists hoping that study of the asteroids will yield clues as to what the early solar system was like will be disappointed. Over the millennia, they have been affected by internal heating, bombardment by space radiation and micrometeorites, some larger collisions causing the melting of their surface layer. They are thus nothing like what they were back then. 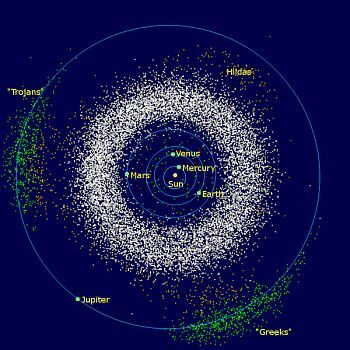 Called the Main Belt to distinguish it from the Kuiper Belt, this is the collection of asteroids occupying a space starting roughly at the orbit of Mars and extending almost to that of Jupiter. It is thought to be 111 million miles wide and its densest part is about 260 million miles from the Sun. This means that the nearest asteroids are only around 56 million miles from Earth and, occasionally, some have strayed close to our planet, one or two even colliding with it. It is estimated that, on average, an asteroid with a diameter greater than half a mile strikes Earth every 500,000 years. Many other, smaller impacts occur much more frequently, if they survive burning up in the Earth's atmosphere. 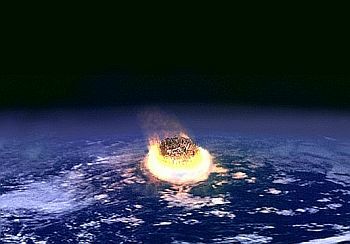 Very occasionally, despite the vast distances separating them asteroids can collide with each other and a study made in 2007 suggested that one such occurrence, that of 298 Baptistina, caused fragments to be fired off into the inner solar system, one colliding with the Moon, to form the crater Tycho, another hitting the Earth in Mexico, which is believed to be what caused the extinction of the dinosaurs. Asteroids come in all shapes and sizes, ranging from impressively large down to little more than a dust particle. The second, third and fourth largest are Vesta, Pallas and Hygiea. They have diameters of over 250 miles. The largest, however, is the famous Ceres, at about 509 miles in diameter. 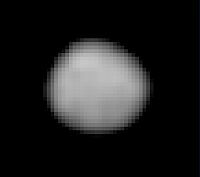 It is so large that has been promoted to being a dwarf planet. It is the only one in the inner solar system. More information on Ceres can be found on the site's page on dwarf planets. 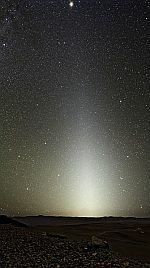 Occasionally, during autumn, an eerie phenomenon known as zodiacal light occurs just before dawn and just after sunset. Little is known about the cause of this astronomical event. At first it was thought that it was the tails of comets, but now astronomers believe it is partly the result of the Sun's rays catching the dust particles found in the asteroid belt. If you refer back to the graphic at the top of the page, you'll see a group of red dots, labelled "Hildas" at the top right corner. Look more closely and you'll see two more groups of these dots, far left and at the bottom. These asteroids comprise the "Hilda Family". Named after the asteroid 153 Hilda, discovered in 1875, they orbit very close to that of Jupiter. They are in a 3:2 orbital resonance with the giant planet, which means that, for every two orbits of Jupiter around the Sun, the Hildas do three. Complex celestial mechanics ensure that there is no collision with the planet. Looking at the graphic again, you'll notice two groups of green dots, the Trojans and the Greeks. 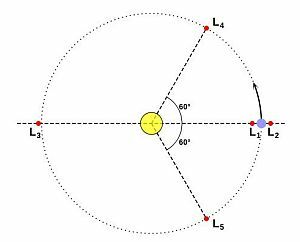 These asteroids actually share the same orbital path as Jupiter, but are positioned at two of the planet's Lagrange points. These are places on a planet's orbit that are very stable and, as this diagram shows, need to be at an angle of 60° in front of and behind the planet. Astronomers estimate that there are as many of these trojans as there are asteroids in the main belt. As Ceres is dealt with elsewhere on this site, we'll just consider the other three that have respectable dimensions. Together with Ceres, these account for half the mass of the entire asteroid belt. 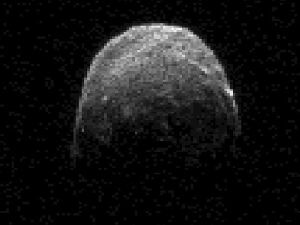 This is the second most massive asteroid and the third largest (after Ceres and Pallas). 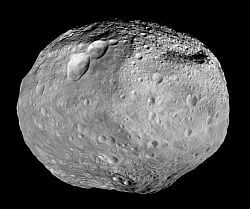 Known more properly as 4 Vesta, it was discovered in 1807. Within the last billion years, it suffered a huge collision which has left an enormous crater in its southern hemisphere. With a diameter of 326 miles, it is the brightest asteroid visible from Earth. This photo, taken by the Hubble Space Telescope, is the best you're going to get, I'm afraid. The second largest, but the third most massive asteroid, 2 Pallas was discovered in 1802. It is 338 miles in diameter. I'm sorry, but you don't get a picture of this one. It has a carbon-based surface and thus is very dark and difficult to observe. 10 Hygiea was discovered in 1849 and, with a diameter of 276 miles, is the fourth largest asteroid. When the asteroid belt first formed, there was a point some 251 million miles out from the Sun where the temperature dropped below the freezing point of water. Called the "snow line", any asteroids beyond that point became encrusted with ice. Various icy comets within the asteroid belt, back in the early days of Earth, may have hit the planet, thus providing the valuable commodity of water. They effectively helped form the oceans. So, the asteroid belt has been, in some ways, a boon to Earth's development. Without oceans, life as we know it wouldn't have formed in the first place. Then, millions of years later, one of them wiped out the dinosaurs, allowing mammals (and, eventually, humans) to flourish. But...wait a minute. What are the chances of that happening again, wiping us out? This is the name of an asteroid with an approximate diameter of just over 1,000 feet that has a trajectory that causes it to pass uncomfortably close to Earth every now and then. 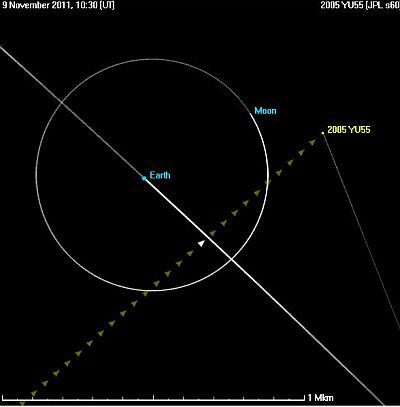 The last time this happened was on the 8th of November, 2011, when it flew past Earth at a distance of only 201,900 miles. That's very close in astronomical terms - it was, for a time, closer to us than the Moon! In fact, carrying on its journey took it within 146,600 miles of our satellite. This graphic shows this quite dramatically. Fortunately, calculations suggest that there is no danger of a collision with this object for at least the next 100 years. Its next visit isn't due till 2041, when its possible distance from Earth has been computed as between 9,450,000 and 9,500,000 miles. Thereafter, it will appear again in 2075 where its closest approach could be as little as 120,000 miles.